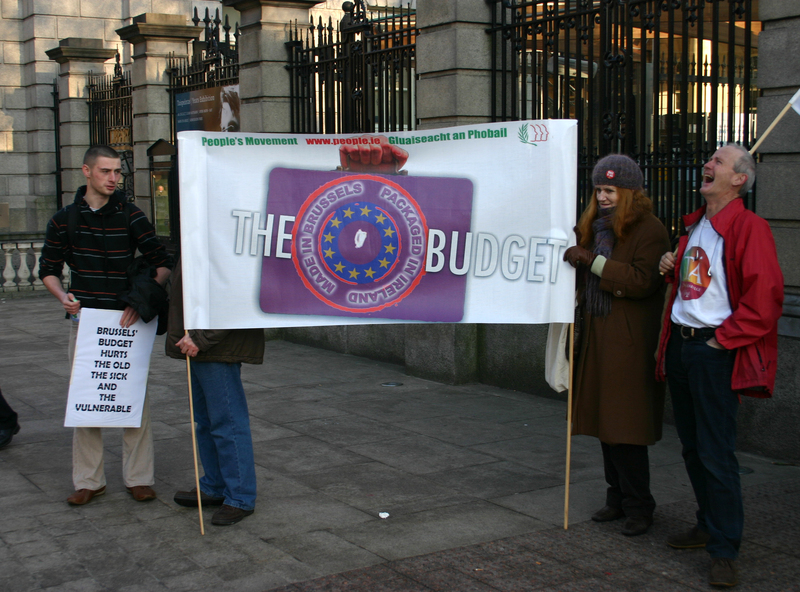 Foreign banks and creditors should lose everything they gambled on banks such as Anglo-Irish. We should repudiate their debt, but instead they are being saved by the taxpayer at the behest of a useless Government and equally useless main opposition parties, the political elite of this country. The Irish state is not insolvent: rather the Irish banking system is broke, and we must move to divorce the banks as soon as possible, rejecting the enormous debt that has been foisted on taxpayers. Instead of negotiating for the tax- payer, the Government chose to sacrifice the last vestiges of sovereignty and to negotiate against us. Not only did our own financial regulator turn a blind eye to reckless lending in the domestic market but the European Central Bank is similarly guilty of allowing particularly German and French banks indiscriminately to lend to the Irish banks so they could fund the speculative splurge—and they've got clean away with it! The ultimate irony is that these same German and French banks will now lend money to the EU to lend to us and will make a profit on the interest the Irish taxpayer has to pay back. Instead we should refuse to pay these outrageous debts we had no part in creating and let these banks fend for themselves. They gambled and lost. And in a move that will cost this country dear, discussions have begun on a mechanism that would ensure no other country in the euro zone would have to suffer this kind of trauma again. It is expected this deal will be concluded at the January European Council meeting, creating a very visible two-tier Europe: with a peripheral Ireland and Greece and then the rest. So our Government has signed up to a deal that will be the last of its type to be accepted by any European government and, in the process, condemned their own people to at least a decade of penury. There is no record of the IMF ever granting a loan where there was not debt forgiveness; so the conclusion can only be that the EU and ECB insisted on saving French and German banks, and our government bent the knee. The country cannot meet an interest rate of 5.8 per cent - higher in the case of the EU portion of this forced loan – without enormous hardship being inflicted on people. Our present outstanding debt is around 90 billion euros. If we use the total 85 billion euros we will have a national debt of 175 billion euros by the end of 2014 and will be required to pay an interest bill of at least 8.5 billion euros per annum. With a ratio of debt to GNP above 100 percent, our growth will have to be in the region of an unrealistic 8-10 per cent in 2014 for the economy just to stand still. Our growth levels can't be sufficient to meet interest payments: the following year's growth would be lower, there being less investment, interest payment more difficult, resulting in less growth, until a huge default becomes inevitable. Why are we waiting, throwing good money after bad? There is no other solution than to repudiate this banker's debt. It is an EU and ECB problem, let them solve it. We are not alone. A number of peripheral countries face similar problems. We know the big powers in the EU, particularly France and Germany, meet outside the European Council to agree policy positions. Our Government should similarly convene meetings of peripheral Member States in order to formulate a common approach to broadly similar problems. Top of the agenda should be the organising of an orderly and structured withdrawal from the euro. A return to national currencies would enable Ireland to deal with its lost economic competitiveness through a currency devaluation which would be expected in such circumstances. That way all citizens would share the burden, not just workers, the poor and vulnerable. Foreign debts incurred in euros, and the exchange rate at which they should be translated into the restored national currencies, could be combined with the other peripheral countries. We could begin by engaging in a structured default, a route being increasingly advocated by Irish economic commentators, and indeed by Angela Merkel. Though these measures would be difficult in the short term, they would stimulate the domes- tic economy, giving us a competitive advantage, and counter the mass unemployment and emigration that are increasingly our lot. These exceptional times require extreme solutions! It is the first duty of the state to protect all its citizens. We need to break whatever EU rules and treaties are necessary in order to protect the interests of the Irish people, and to set about a fundamental change in economic policy and direction. Published in the Newsletter of the People's Movement of Ireland.